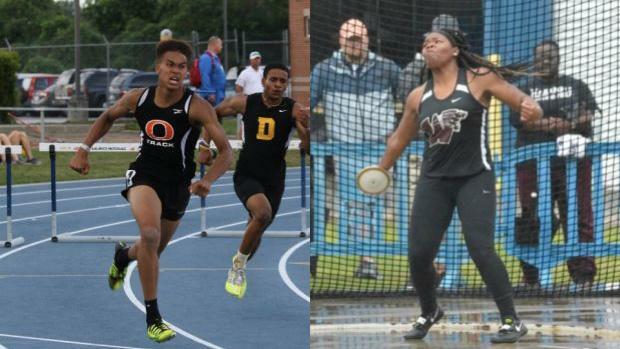 Veronica Fraley (Wakefield) and Jamar Davis (Orange) have been awarded North Carolina Gatorade Player of the Year honors for the 2017-2018 Outdoor Track season. Fraley has been dominant in the throws this year throwing a discus state record of 175-9 where she won both the NCHSAA 4A State Championship and New Balance National Championship in the event. Fraley also moved to NC#2 All-Time in the Shot Put Outdoors with a throw of 49-5.5. Fraley won the NCHSAA 4A State Championship Indoors and Outdoors in the event and also took 4th Indoors and Outdoors at New Balance Nationals in the event. Fraley will end her high school careers as the states best overall thrower as she heads to Clemson in the fall to continue her career. Davis ends the year with an indoor and outdoor All-American finish in the Triple Jump. He also won the Long Jump and Triple Jump indoors and outdoors at the NCHSAA 3A State Championships. He also picked up a runner-up finish in the 300m Hurdles in an NC#5 mark of 38.02. Davis placed 16th at the National meet in the 400m Hurdles clocking an NC#2 and NC#24 All-Time mark of 54.40. Davis holds PRs of 50-3.25, good for NC#2, in the triple jump and 23-5 in the long jump. Davis will continue jumping and hurdling at NC State this fall. Below is all of North Carolina Outdoor Track Gatorade Players of the years dating back to 1986 when the award first took place for Track & Field.